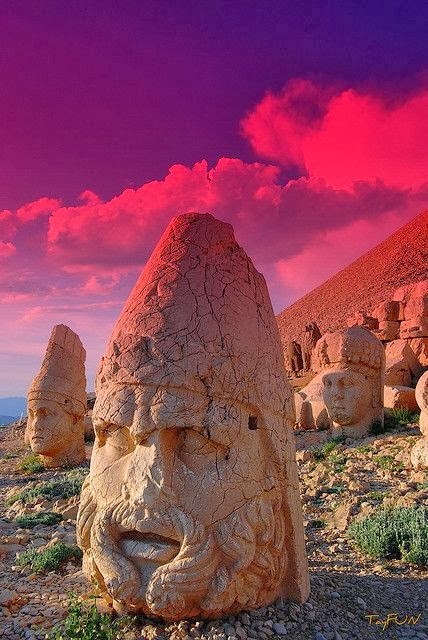 Nemrut or Nemrud is a 2,134 m (7,001 ft) high mountain in southeastern Turkey, notable for the summit where a number of large statues are erected around what is assumed to be a royal tomb from the 1st century BC. The mountain lies 40 km (25 mi) north of Kahta, near Adıyaman. In 62 BC, King Antiochus I Theos of Commagene built on the mountain top a tomb-sanctuary flanked by huge statues (8–9 m or 26–30 ft high) of himself, two lions, two eagles and various Greek, Armenian, and Iranian gods, such as Hercules-Vahagn, Zeus-Aramazd or Oromasdes (associated with the Iranian god Ahura Mazda), Tyche, and Apollo-Mithras. These statues were once seated, with names of each god inscribed on them. The heads of the statues have at some stage been removed from their bodies, and they are now scattered throughout the site.